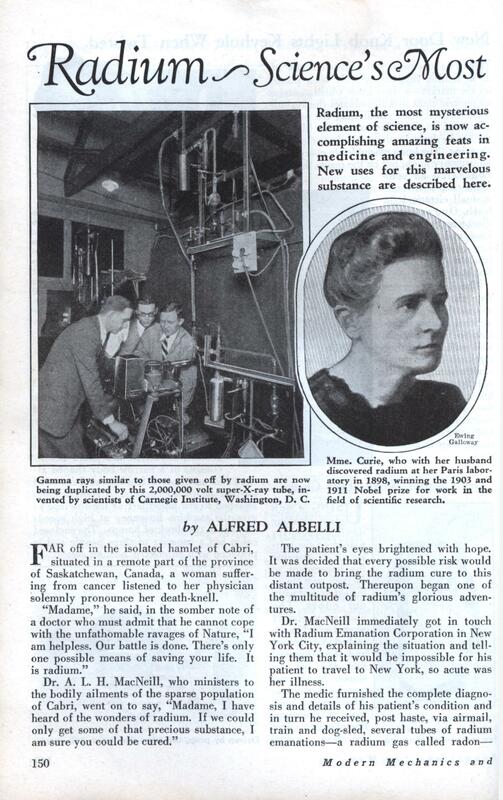 Radium, the most mysterious element of science, is now accomplishing amazing feats in medicine and engineering. New uses for this marvelous substance are described here. FAR off in the isolated hamlet of Cabri, situated in a remote part of the province of Saskatchewan, Canada, a woman suffering from cancer listened to her physician solemnly pronounce her death-knell. The patient’s eyes brightened with hope. It was decided that every possible risk would be made to bring the radium cure to this distant outpost. Thereupon began one of the multitude of radium’s glorious adventures. Dr. MacNeill immediately got in touch with Radium Emanation Corporation in New York City, explaining the situation and telling them that it would be impossible for his patient to travel to New York, so acute was her illness. The medic furnished the complete diagnosis and details of his patient’s condition and in turn he received, post haste, via airmail, train and dog-sled, several tubes of radium emanations—a radium gas called radon— and full directions. The heroic adventure resulted in a cure. The radon is usually contained in tiny platinum tubes, one-eighth of an inch in diameter. They are encased in rubber tubes and do not come into contact with any other metal, in order to prevent secondary radiation. When radon tubes are then inserted into the malignant tissues, the healing process commences straightway. Occasionally radium itself is used in healing, but the universal use today is the application of the gas, which in the final analysis is the substance which contains the curative properties. That is radium as it is utilized today. But to get behind this latest development, which scientists readily admit is far from the goal which radium still holds out to them, one must plunge into its inner secrets. Heretofore, so little has been available to the layman on this subject. The truth about radium has remained complicated and concealed in a maze of intricate equations, chemical symbols and formulas, understood only by scientists. The evolution of radium may be traced back to 1896, to the experimental work of the French scientist, Henri Becquerel, who discovered the action of radium rays. Becquerel found that a uranium salt sent forth rays which made an impression on a photographic plate enveloped in black paper. He also found that these rays could pass through thin plates of metal and other objects opaque to light. However, it was Madame Marie Curie who made one of the most momentous discoveries in medical history, as well as in the world of science in general. Born in Warsaw, Poland, on November 7, 1867, where her father was a professor of physics, Mme. Curie migrated to Paris to continue her studies and experiments. In the French capital she met Pierre Curie, a young French scientist, and two years later, in 1896, they were married. Both had chosen the field of scientific research for their life work. They used a rickety woodshed on the outskirts of Paris for their laboratory. They were poor, but in their hearts throbbed golden dreams. Both of them followed the experiments of Henri Becquerel with uranium salts. Quite accidentally, Madame Curie stumbled upon a curious fact. She observed that some of the rays emanated from uranium exerted an activity three or four times greater than that of pure uranium itself. This the Curies had established, to themselves, as a scientific fact, though their skeptical friends frowned on their pretentions. Madame Curie then began her experiments with pitchblende—a hard, blue-black ore that looks something like magnetite, but is much heavier. She suspected that this compound of uranium contained some hitherto undetected substance with far greater radioactive qualities than the metal uranium itself. It was this product which Madame Curie determined to isolate and experiment with. After scores of tedious chemical operations, she succeeded in separating two sub- stances from pitchblende. One she called polonium, after her native land, Poland, and the other, radium. These discoveries were made in the wood-shed laboratory, where an old gas furnace and some melting-pots had been installed. It was there that she often spent entire days stirring large pots of chemicals with a long iron rod. It was from these crude tools and “never-say-die” heart that radium was given to mankind for practical uses in 1898. Four years later the Curies announced that they had succeeded in making their radium a pure chemical body. In 19.03 and again in 1911 Madame Curie was awarded the Nobel Prize. In 1907 the late Andrew Carnegie, the steel magnate, presented her with a laboratory which was the first real workshop she ever enjoyed. Scientists gradually discovered that radium or its gas, called emanations, could be used in treating cancer, tumors, ulcers and allied conditions. The “Becquerel burn” perhaps led to the first discovery of the effect of radium on the skin. Henri Becquerel hap- pened to place a tube of very active radium in his vest pocket, just to keep it handy. He kept it there for several hours, never suspecting anything, then put it back in his laboratory. Two weeks later he discovered a burned area on his body. Recalling that the seared skin was exactly where the radium tube had been, he communicated his discovery to Pierre Curie. So fascinated was Pierre Curie that he decided to experiment with his own skin, applying the radium to his hand in weak degrees. He became amazed at the possibilities presented. In turn he loaned a tube of radium to the Saint-Louis Hospital of Paris for further medical experimentation. It was first applied to a case of tuberculosis of the skin. The results were excellent. The patient was thoroughly healed. Soon the demand for radium for therapeutic uses spread like wild-fire. The name of Curie was clothed in glory, but the modest couple preferred the quiet and peace and industry of their little laboratory, offering their discoveries to the world without desire for recompense—their lives dedicated to science and humanity. Radium is now the most rare and the most precious of metals. Consequently, it was a great relief when an American physicist, William Duane suggested the insertion of radon, the radium gas, into the tissues and leaving it there a number of years. It is one of radium’s freak but beneficial properties that it does not injure normal tissues but destroys the diseased ones. Uranium, and therefore radium, is found in this country in carnotite and its associated minerals, and in pitchblende. Carnotite is a lemon-yellow mineral, usually found in pockets of sandstone deposits. The mineral may be in the form of light yellow specks spread through the sandstone, or as yellow incrustations in the cracks of the sandstone. Carnotite was first discovered on this continent in 1887 by a prospector named Charles Poulot, in western Montrose county, Colorado. There are other vast carnotite formations in southwestern Utah, 11,500 feet above the sea level, in high, arid and barren mountain regions. There are no roads to these Utah mines, only narrow, perilous paths which are traversed only by burro trains. There is no water there, nor any wild animals or vegetation for food. It is a ghastly region with the temperature over 100 at high noon, and sinking below zero at night. The ore is hand-picked and packed in 80-pound sacks. A burro bears two of these bags down a precipitous mountain trail to a wagon road eleven miles away. The best that a skillful miner can do is two burro-loads a day. The ore is carried to an automobile highway, and finally reaches a railroad only to travel another 2,000 miles to a chemical plant. A long, laborious process is used in the manufacture of radium from carnotite. Rather vaguely, the process has been compared with the methods used in the purification of table salt. This salt is placed in solution and the impurities driven off by crystallization. However, this is child’s play alongside the task of extracting radium from carnotite. The carnotite is placed in solution, and step by step the numerous other elements are driven off by crystallization, each step making the radium purer. Here the preciousness of radium becomes evident when it is revealed that it takes from five to six hundred tons of carnotite ore to produce a single gram of radium. At this point it may be appropriate to mention that in 1923 a gram of pure radium cost $120,000. The fact that this particular gram could “live” and keep its energy for 17,000 years did not offer much solace. Today, because of simplified methods of production, the market value of a gram is $70,000. This means that one ounce of radium would cost $1,960,000. The New York State Hospital at Buffalo recently bought $300,000 worth of radium at that rate. Its records show that 800 persons have been cured of cancer since its use there. The invention of radium emanation apparatus has helped the cause immensely. The use of radium has by no means been confined to the field of therapeutics. Its services have been extended also to the field of structural engineering. Recently, with a bit of radium no larger than a .22 caliber bullet, three Washington, D. C. scientists startled the world by demonstrating that the powerful “gamma ray,” derived from radium, can actually penetrate a ten-inch. piece of steel, an accomplishment hitherto never realized. The gamma ray is similar in use to the X-ray, but many times more powerful. Its all-revealing “eye” can see clear through the hull of the toughest battleship, thereby measuring strength, or revealing any structural defects that might be present. This newest method of ray photography is the work of Dr. Robert F. Mehl and Chas. S. Barret, both of the Naval Research Laboratory, Washington, D. C., and Gilbert E. Doan, assistant professor of metallurgy at Lehigh University. The mechanism of the gamma ray is simple in operation. With it, engineers simply need place a bit of radium into a little tube behind a steel casting of a bridge and a photographic plate attached to the casting will record the comparative soundness of the steel. Workmen can take pictures of the “insides” of a locomotive wheel, and a group of divers can determine the strength of a propeller strut on a man o’ war before subjecting it to the tremendous pressure of the deep seas. The chief advantage of radium is its simplicity. Very easily the technician can group the objects he wants to photograph, then simply drop the bit of radium into the tube before starting his morning’s work on other projects. The radium rays will operate during the day and the technician can pick up his developed plates when he finishes in the evening. An important phase of gamma light photography is its sensitivity. It will reveal defects as minute as two per cent of the material’s thickness, a fact which indicates that it will be useful in testing heavy guns and metal gun turrets. 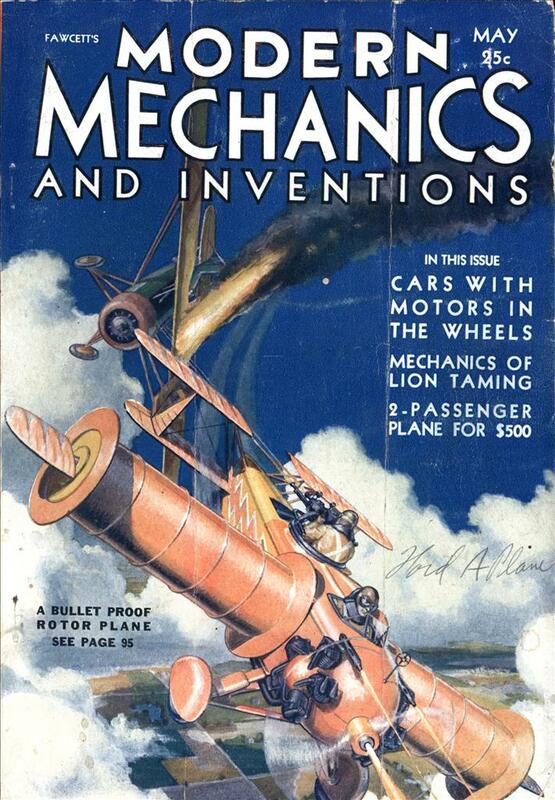 Certain Navy experts point out that a gamma ray picture or “radiograph,” may properly be called a “textbook of metal defects,” since it teaches the student of metal construction all he wants to know concerning the “insides” of a sheet of metal. Any defects stand out on the photographic film as dark spots or streaks, in contrast to the lighter background of the rest of the material, thus accurately portraying the features of the hitherto hidden cracks and voids. An important industry which is constructing equipment on which a great deal depends requires complete information on the trustworthiness of the materials utilized. In the case of a modern power plant, defective material used for this purpose may result in the loss of hundreds of thousands of dollars and even in loss of life. By the use of radium, however, all these difficulties can be eliminated. “It is one of radium’s freak but beneficial properties that it does not injure normal tissues but destroys the diseased ones”, the author says, only three paragraphs after mentioning Becquerel’s burned skin. At the time this was written, it was already well-known that it was easily possible to overdose on X-ray and ultraviolet treatment (which had been used for skin disorders for decades), but ionising radiation in general was still not really understood. Three years after this piece was published, Marie Curie died of radiation-related aplastic anemia.